Watch baby grow with Pearhead's watch me grow milestone photo blanket. This adorable photo blanket set includes a 100% cotton muslin blanket and 3 photosharing props to track baby's growth during their first year. 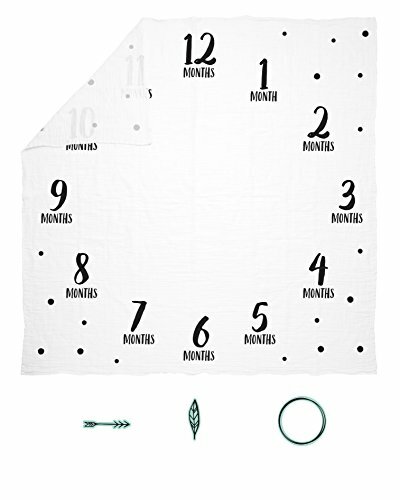 The soft blanket is decorated with numbers 1 through 12 in a circle, perfect for sharing baby's monthly milestone pictures. Use the included and trendy props to show everyone baby's age. Once you're ready to take baby's monthly picture, lay baby down in the center of the blanket and use the milestone prop of your choice to highlight baby's age. The circle is great for circling each month of baby's first year. The arrow can be used to point to the month. And the feather can be used to underline each month. Use one for each picture or have fun and use all three. Snap a photo and share with everyone you love on your social media pages. You'll love looking back at each monthly picture to see how big baby has gotten. The modern black, white, and mint colors make this perfect for baby boy or baby girl. Don't forget to add this to your baby registry. Not expecting but know someone who is? This is the perfect baby shower gift. Have fun wrapping this adorable gift up and giving to the expecting couple. They will love this keepsake and will be able to cherish baby's monthly pictures forever. Capture the moment and share the love with Pearhead's watch me grow photo blanket.